The newly formed Jacksonville Slot Car Club is having their first racing event. October 6, hosted at Slot Car Raceways and Hobbies in Jacksonville, Florida. Track opens at 1 PM. Race Tech table opens at 1:15. 1st – Scalextric modern NASCAR, completely boxstock. Except, we do allow changing to any rubber/urethane tire that is within the body lines. Magnets are limited to 300 down-force. 2nd – Slot.it Group C Sports Car, completely boxstock. Except, we do allow changing to any rubber/urethane tire that is within the body lines. Magnets are limited to 300 down-force. … more specific rules are available. Just send me a IM. These are simple entry level racing programs to introduce new racers into this hobby. If you should be in North Florida on Oct. 6, please drop in and be a part of the festivities. Heck, there will plenty of members here with a loaner for you, too. Get your game on! Sunday’s race was a huge success. Both Scalextric NASCAR and Slot.it Group C was won by Greg Walker, owner of The Race Place, from Holly Hill. Making the trip with Greg was his sidekick Phill and the honorable Jim Smith. Bob DeWoody, owner of DeBary Glen Raceways, served as our guest Tech Director for this race. All of our local racers welcomed our guests with a spirited race run with the CRASH and BURN tradition that occasionally resembled a CRASH Derby a little too often. Boys will be boys, after all. Thanks to all the racers that made this first race of the Jacksonville Slot Car Club a very memorable event. Thanks, also, to Jacksonville’s Slot Car Raceway and Hobbies who had their “Florida Orange” track in tip top condition. Slot Car Raceway and Hobbies is the home track for the Jacksonville Slot Car Club. Here are the results for the Jacksonville Slot Car Clubs 1/32nd scale slot car race on Sunday, October 27th. Held on the fabulous Florida Orange race track. At Johnny Banks’ Slot Car Raceway & Hobbies, in Jacksonville, Florida. Thanks to all our racers and congratulations to the podium winners for their achievement. The Jacksonville Slot Car Club will be holding 1/32nd scale slot car races at Slot Car Raceway & Hobbies in Jacksonville, Florida. Sunday November 10th. Track opens at 1:00 pm. Drivers meeting at 1:15 with tech table opening just after meeting. The first race, beginning at 1:30 PM is Scalextric Modern NASCAR. This is a novice class using box stock cars. The second race is for Slot.it Sports Car Prototype Group C and will be held immediately after the NASCAR race. This is also a box stock class. As a bonus if time permits, Scalextric Trans Am will be our third race of the day. Rules are available at the track. Rules can also be viewed on our Facebook Group Page https://www.facebook.com/groups/609779495751644/. 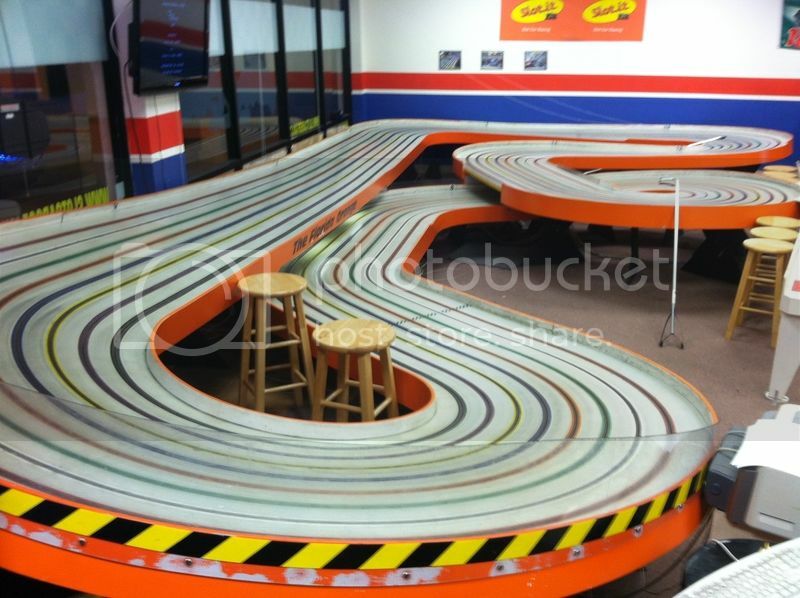 Slot Car Raceway & Hobbies in Jacksonville, Florida is the home of the Florida Orange, 106ft, eight lane slot car track. This is no speed bowl so put on your Big Boy pants and come race on a great technical race track. Slot Car Raceway & Hobbies is the home track for the Jacksonville Slot Car Club. Run, tune and show what you got every Tuesday night and race 1/32nd scale slot cars with us every other Sunday afternoon. Come have fun with us and find out how our slot car hobby can lead to acquiring substantial skill, knowledge, and experience. Here is our home track, the Florida ORANGE. Just one of the fine tracks at Slot Car Raceway & Hobbies in Jacksonville, Florida. Here are the results for the Jacksonville Slot Car Clubs 1/32nd scale slot car race on Sunday, November 10th. Held on the fabulous Florida Orange race track. At Slot Car Raceway & Hobbies, in Jacksonville, Florida. As a special treat, we had visitors from other clubs in Florida, come up for this race. Larry Granger from Fubar Motorsports along with Marty Stanley and Bob DeWoody from DeBary Glen Raceways Club. We really enjoyed our time with these guys. John Ford, publisher of SARN donated subscription prizes for winners in all three classes. Everybody Happy Happy. Thanks to all our racers and congratulations to the podium winners for their achievement.